The winter flurry of letters is landing in mail boxes around the globe this time of year. I just heard from three ecstatic students who learned last week they were accepted into their dream schools–one was Harvard, another Wellesley, and a third Middlebury. I felt excited and proud for them. But I will feel equally excited for my students who will soon learn they will be attending schools in our University of California system, whether it’s Berkeley, UCI or Santa Cruz, or other state universities such as UW, Boulder and U. of O, and especially those getting into the small liberal arts colleges no one has ever heard of, but are true gems. And I also can’t help think about those who are getting those awful cryptic rejections in the mail at the same time. They can really sting. But if you are still waiting to learn where you will be attending college (or are still working on your college application and essays), just know that you will land in the place that is right for you. It may not be that dream school, or the one you couldn’t wait to tell your friends about getting into. But chances are you will attend a school that you will end up absolutely loving. It’s all about finding the right match–kind of like shoes, if they don’t fit right, they will hurt your feet. The point is when a student (or parent) pushes into a school for the wrong reasons, or lands in a school that’s not right for her for whatever reason, he or she often will be miserable, struggle and even have to return home–and start from scratch. One friend just told me her talented, brilliant daughter who started at UCLA this fall came home after 10 days. But I’m confident she, too, will get back on a track that is perfect for her. Amen to that! Another reason to not let rejections from prestige or reach schools ruin your day is that many of these schools would not have determined your future success anyway. Jay Matthew, author of one of my favorite college guides, Harvard Schmarvard, just wrote an article that supports the case that our top political and business leaders often came from schools that were considered sub-par by some. In fact, one Princeton research paper he quoted said that “except for low-income students, the selectivity of students’ colleges did not correlate with their success in life, as measured by income. More influential were what the researchers called “unobserved characteristics,” such as persistence, humor and warmth. Of course, if you are on your way to Stanford, Yale or any of those elite institutions, way to go! But for everyone else, you are equally lucky and are about to have the time of your life! Just have faith in the path you are on and that it will lead you exactly where you need to go. One side note: I’m holding a college application essay writing contest, and plan to include the top 50 submissions in my upcoming college of sample essays, called “Heavenly Essays.” If you are interested in submitting your essay(s), please read Essay Writing Contest for details. Thanks! 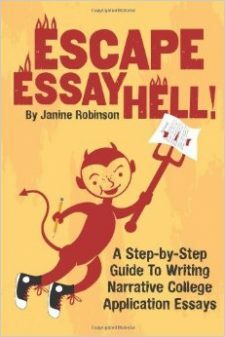 Looking for a great book of samples for college application essays? College Application Essay Contest Winners! Admissions Officers From Select Colleges Confirm They Want Stories! Essay Contest! Winners Will Be In My Book! This is such a great point. Success has so much to do with attitude and comfort, and way less to do with the school itself. Some of these factors–such as the way location or size of school will fit your personality–are difficult to know until you go. But it is so important to emphasize that a good fit might not mean the greatest prestige, but rather the kinds of opportunities you’ll have. I attended an Honors College at a large public university. And that suited my personality, academic interests, and general passions far better than a small liberal arts school would have. But I had friends in the same program who felt dissatisfied in the same place. It has so much to do with the individual.